Though it may seem like this semester is dragging on, the holidays will be here before you know it. There’s nothing better than decorating your house for the holidays, but when you’re in college, it’s hard to find the time or money to decorate. 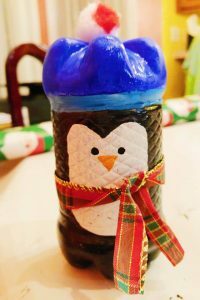 But there are several quick and easy ways to decorate your dorm or apartment for the holiday season. All of the supplies can be found at the dollar store. 1. Wrap any picture frames or artwork you already have in festive wrapping paper. This is simple to do and only requires wrapping paper, bows, scissors and tape. 2. Make your bedding festive and bright by covering it in a holiday blanket. Most of us already have holiday blankets from when we were younger. Throw it onto your bed for a cozy and decorative touch. 3. Add some Christmas cheer to your windows by hanging ornaments with ribbon or string. Simply tie the ribbon to the ornaments and hang in the window. It’s quick and makes a statement. 4. This one is for the crafty people. 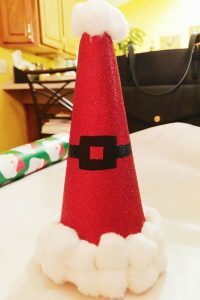 Make a Santa hat or mini Christmas trees out of Styrofoam. For the hat, I took a red piece of glittery foam and glued it around the Styrofoam. Then, I glued cotton balls to the bottom and top. Lastly, I painted a belt buckle for the hat but you could also use a black marker. 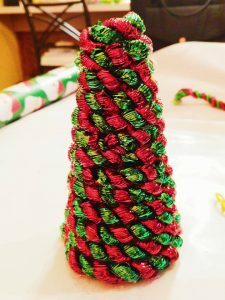 For the trees, I took garland and wrapped it around the Styrofoam cone, gluing it along the way. 5. 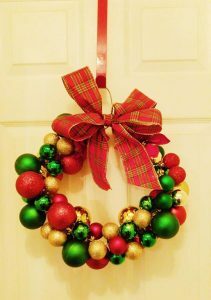 Make a wreath out of ornaments and a wire clothes hanger. You probably have an old wire hanger somewhere and the ornaments were a dollar for a pack of 14. Take your hanger and stretch it into a circle shape. Then, unwind the ends at the top. I would recommend gluing the tops of the ornaments so they don’t pop off. Start stringing the ornaments onto your hanger. You can add different sizes and colors to add variation and texture to your wreath. I used about 50 ornaments. Once all the ornaments are on, wind the ends of the hanger back together and you can finish off your wreath with flowers or a bow. 6. Make cute penguins out of recycled plastic bottles. This last project requires two plastic bottles, some paint, ribbon, scissors and tape. Start off by cutting off the top of one bottle and the bottom part of the second bottle. Tape the two parts together. Cover bottles in white paint for a more opaque color payoff. Sketch out the face of the penguin and paint the rest of the body black leaving the top part white to make the hat. Then, color the hat any color you want. Paint on two eyes and a nose. Finish off by tying a thin piece of ribbon around your penguin for a scarf.